‘No matter how long the winter, spring season is sure to follow.’ Spring is believed to be full of promises. This is when the sun shines more brightly, the flowers start blooming, and everything in our surroundings feels fresh. In a report released recently, Sotheby's International Realty Canada stated that the recent regulations set forth by the government have led to an "unprecedented levels of uncertainty" for the high-end home market that is moving into the key spring purchasing season. According to the data gathered by Realtors in Canada, a little divergence has been predicted in the Vancouver’s current housing market trends. It has been said that Metro Vancouver’s high-end home sales will continue to normalize. We all know that in the year 2016, the government of B.C. imposed a 15% foreign home buyer tax on Vancouver homes and the Vancouver city levied a tax on empty houses. To this Henderson commented, "We are forecasting that we are going to continue to see the market adjust to this new reality." Henderson further talked about the drop in sales in Metro Vancouver. He said that the sales of houses for more than $1 million fell to 531 units in the month of January and February of the present year. This figure has dropped by 45% when compared to the sales of last year. 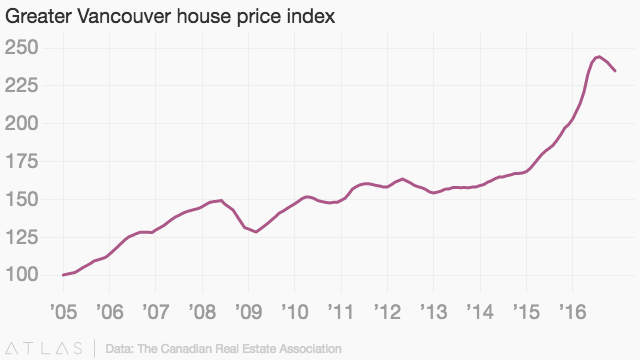 Even the luxury homes in Vancouver were affected quite dramatically. Henderson still believes and predicts that the strength in the market will remain constant in the spring season, only if the B.C. government doesn’t introduce new policies and regulations that would be specifically aimed at the housing market. After more than half of a year of B.C. government’s announcement regarding the foreign home buyers’ tax in Vancouver, foreign home buyers’ interest in the area’s housing market is finally achieving a steady level. According to the latest property transfer tax data, the foreign residents in the province were accounted for $93 million in residential sales in the Metro region last month. The figure mentioned is a little over by 3% of both the number and value of all transactions that took place. But the figure is below the 16.5% value of all transactions that was documented just before the provincial tax came into effect in August. The foreign home buyers and the tax levied on them have constantly been on a roller coaster ride and experienced many alterations. After the imposed tax, the complete data of the activities in the market is unavailable, and sales activity has dropped across the province since summer. Thus, direct contrasts are hard to draw. Despite that, Vancouver is beginning to account for a minor portion of transactions involving foreign residents across B.C.